I know this is a general question, but I know youll all help too. Might be Marlin and Nemo for now, but maybe it'll be more like Marlin and Coral, later. Clownfish are protandrous hermaphrodites, so possibly a dominant one will go female in the future. Anyway, the tank is looking good, looks like you've got started right. The plastic plants look kind of off in a marine tank, though. Just saying. you know I actually agree with you on the plants, any suggestions for brightening this tank up with some nice colors? Give me suggestions PLEASE....I thought those plants looked out of place! Mushrooms, Mushrooms and then some Mushrooms! Sun Corals also but you'll have to feed the polyps individually and people might tell you not to get one because theyre difficult to keep - these people will have never kept them before. Also Duncans Corals will work they are a deepwater species. Take those crappy plants out! mushrooms??? ?..I have never heard of nor seen these at my LFS...can you elaborate further? .....they don't make a 50/50 in 15"...hmm who knew? Yep, get rid of those plastic plants! In a few weeks you would be getting rid of them anyway, as they are notorious for algae growth in SW tanks. 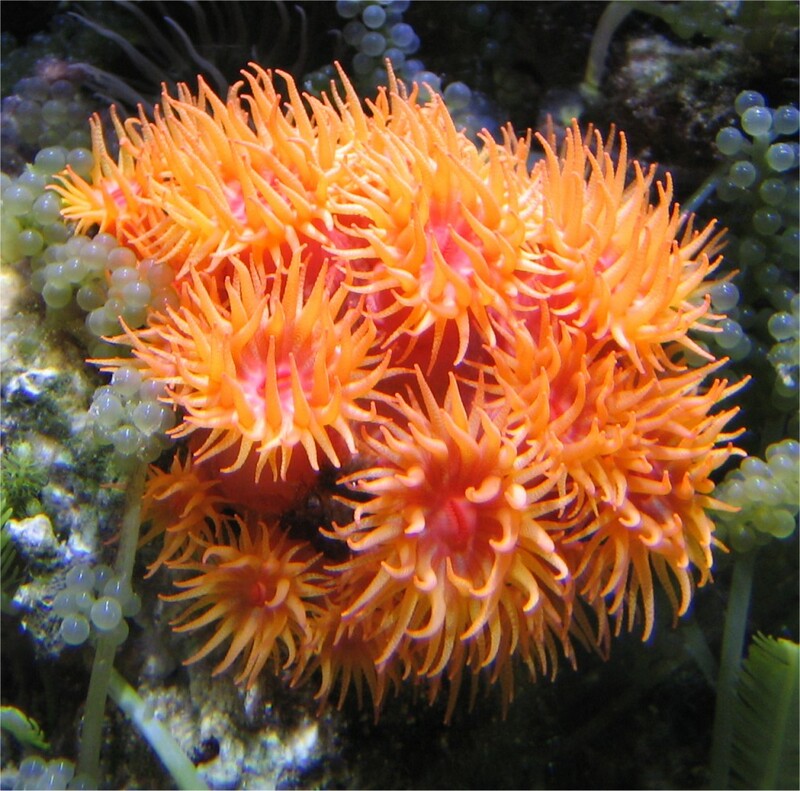 Though your clowns would better enjoy an anemone, or a frogspawn coral, you do no have the proper lighting for them to live. Maybe in the future you can get a smaller sized metal Halide lamp, and then get some nice corals and/or an anemone for the clowns. Just remember, that any corals that require no light at all, must be target fed. 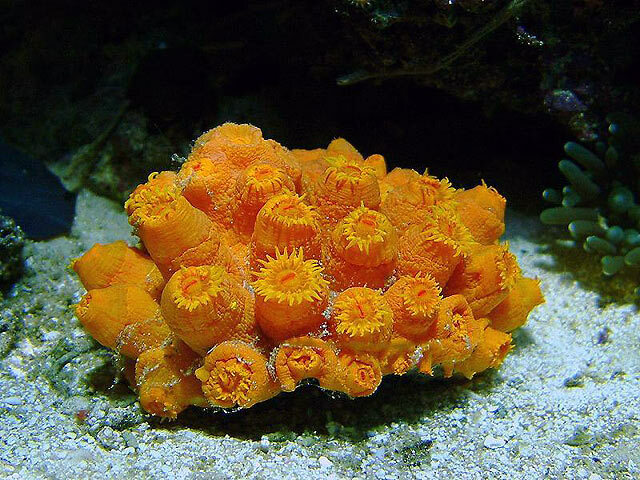 These are relatively easy to keep corals, but must be target fed. FYI: All pics in this post were found on Google. sorry for the stupid question but what is target feeding? and also, my issue, along with the plastic plants, is all of that background showing above the live rock....I know I can stack some more live rock up there, but my wallet took a huge hit last weekend and im trying to take it easy with spending much more money right now. Any suggestions for something with some height that would fill some of that up? Target feeding is feeding directly on the coral. Put your coral food in some water, using a turkey baster filled with the water/coral food, you simply hold it over the coral polyps and let the food ooze/drip out onto them. Or very lightly squeeze the foods out onto the polyps. Thus you target feed the corals instead of feeding the whole tank. If money is a problem, I would suggest you wait for a bit before diving into the coral aspect. As you will need to by good foods for them. And take your time with the tank, as patience is the most important thing when it comes to SW tanks. As for the look of the tank, I kinda like the open area at the top look. so im guessing the food/water mixture is somewhat thicker than the water and will drop easier onto the corals? Is that the idea? Not really. Just that the food is placed directly on them. Thus you "target" the polyps of the corals. If you just place it into the water and let it swirl around and mix with the entire tank, you waste any that does not make it to the coral's polyps. Thus you not only waste part of it, but the corals don't get as much to eat either. You sit at a table in a large restaurant and order your food. They bring it out, and place it all over the room on different tables. The potato in once corner table. While the steak is in another corner table. Your drink is in the center of the room. And yet you are unable to get up from your seat. But you stretch out and can just barely reach the desert that was placed on the table next to you. So you get a little to eat, but not much. The rest of the food has been wasted. Where as, if you are the target for the food, they will bring it out and place it directly on the table in front of you to eat. Ahhh thats makes it easy to understand about the target feeding...thanks.....hey another question...this one is about snails...I have 3 turbo snails, but I noticed what I think was a very very small baby snail. what gives? was it in the live rock from the LFS and just came ou? have the snails in the tank done whoopie already???? ARe they going to hurt my tank if there are too many? I only saw 1, but after a couple of hours I tried to locate him again with no luck, so who knows how many more there are. There is a good chance it came from the LR, I have seen all kinds of things come off of it. The majority of snails that come with the LR are usually beneficial, or at least harmless. I think it's unlikely for them to reproduce in the tank, although I may be wrong. They should all be fine in there unless you have so many that they run themselves out of food. You will start to find a bunch of things from the LR, even after months go by. oh yeah and a visit to my LFS yielded a worker trying to sell me what I believe were called Blue Damsels for my tank, after I told him what size and such and that I wanted to add some color to the tank (I was talking about mushrooms). But I wasn't convinced....however my wife really really likes them.....can they be done or not...saying no will not hurt my feelings but if I could get away with it without hurting anything, please do tell. no. i wouldnt advise anyvmore fish and especially not a damsel - theyre mean and nasty and will bully your clownfish into hiding. also why would you need to clean your sand? there should be no feaces there and if it is algae i suggest directing the flow to the problem area and eventually adding more flow. what kind of algae is it? some algae is normal in a new setup such as diatoms then cynobacteria which is really ugly and is deep red. peel that off. this image was taken from google.com and they and their respective owners own all copyright.